…since April? (Oh dear. You’ve died, haven’t you?) 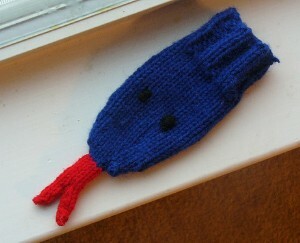 Anyway, you can now get the directions for the snake ‘sock puppet’ here. I tried to write directions for two larger sizes, so if anyone actually tries it out, do let me know how it goes! He’s cute, but girl I have been holding my breath for about a year on that Genevieve (I think) sweater pattern of yours! :smile:Hola que lindas cosas has hecho, lo malo es que yo no se tejer a palillos:roll:. bueno eso no mas era.